John was born to Victor and Elaine Howard in Charleston, WV, on August 1st, 1960. He was the youngest boy in a family of six children. He was raised into a struggling middle class family where he was taught that God, the Orthodox Church and family were of primary importance. This atmosphere of love, kindness, concern for others and hard work put him on career path toward medicine. He graduated from high school in 1978 and received the Harvard Book Award for the outstanding junior student of 1977. He completed college in three years and went on to graduate from the University of Miami School of Medicine in 1985. He began his post-doctoral career in Internal Medicine at Jackson Memorial and Mount Sinai Hospitals in Miami. He then completed a residency in Diagnostic Radiology at the Baylor College of Medicine at the Texas Medical Center in Houston and there received the distinction of Chief Resident. He finished his fellowship training in Interventional Radiology at the Thomas Jefferson University Hospital in Philadelphia. He is board certified in Diagnostic Radiology scoring in the top one percent in the country on the board examination and has a sub-specialty board certification in Vascular and Interventional Radiology. He initially met his wife Lanette in 1975 when they were teenagers and both were members of the Syrian-Lebanese American Club. Life took them on different paths but they were reacquainted in 1984 and married on February 20th, 1988. She is John’s anchor and rock that he sometimes takes for granted and without whom he would not have accomplished what he has in life. They have three beautiful girls, Brooke, Amanda and Tara, ages 21, 19, and 16 respectively. Brooke and Amanda are at the University of Florida and Tara attends Fort Myers High School. From Philadelphia, they moved to Fort Myers in 1991. While Lanette was taking care of the family and providing for their daily needs, John became established within a local radiology group, Florida Radiology Consultants. After serving as the financial officer and head of billing, he eventually became president and managing partner. Under his leadership the group rapidly expanded with the number of radiologists doubling. While spearheading the opening of three outpatient imaging centers the firm grew from 3 non-physician employees to over 45 employees. Prior to this growth he went back to school and obtained a Masters in Business Administration (MBA) graduating first in his class at the University of South Florida. At this same time he was Chief of Interventional Radiology for the Lee Memorial Health System. At this position he was the first Interventional Radiologist to perform many procedures new to this area. These included non-coronary peripheral and renal intravascular stenting, biliary and urological stenting, uterine fibroid embolization, and minimally invasive tumor embolization to name a few. In conjunction with his vascular surgeon colleagues he was also the first interventionalist to perform endovascular stent-grafts for the treatment of abdominal aortic aneurysms. The American Roentgen Ray (Radiology) Society has awarded him the Gold Medal Award for his work in thoracic imaging. He has presented papers and scientific exhibits and has been an instructor at several national academic meetings. He has also published several articles the most recent in 2007 dealing with image-guided treatment of ureteral-arterial fistulas in patients having undergone radical pelvic surgery. John has used his gifts and opportunities in a variety of other ways to help benefit the community. For 8 years he chaired and coordinated a free cardiovascular screening event that assessed close to 5,000 people and discovered many serious and life-threatening diseases. He has been a neighborhood support leader for the Lymphoma and Leukemia Society and the Multiple Sclerosis Society. He has also been an active supporter of the IOCC (International Christian Orthodox Charities), the OCN (Orthodox Christian Network), the OCF (Orthodox Christian Fellowship), St. Jude’s Cancer Research Hospital, the Make-a-Wish Foundation, and the Children’s Cancer Network. John was born and baptized into an Orthodox Christian family. He has regularly attended church and has been an active member since his youth. He served on the Parish Council for 16 years, five of which were as president of the council. He considers the purchase of the 5-acre parcel to the east of the church as the highlight of his tenure as president. He has served in the altar as the adult supervisor during his 20’s as well as for the last several years here at the Annunciation. He recently completed the St. Stephens Course of Studies in Orthodox Theology and has started work on a Master’s in Applied Orthodox Theology. Fr. John was ordained into the Diaconate by Metripolitan Alexios of Atlanta at The Annunciation Greek Orthodox Church in Fort Myers, FL. Fr. 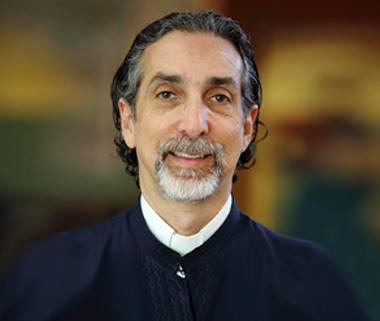 John has accepted the position as Spiritual Advisor to The Kimberly Center, a Holistic Center for the Treatment of Alcoholism and Substance Use Disorder.